Idasanutlin, a selective small-molecule MDM2 antagonist in phase 3 testing for refractory/relapsed AML, is a non-genotoxic oral p53 activator. To optimize its dosing conditions, a number of clinical pharmacology characteristics were examined in this multi-center trial in patients with advanced solid tumors. 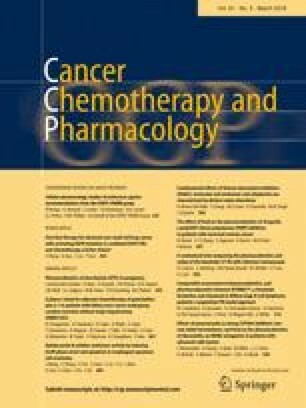 This was an open-label, single-dose, crossover clinical pharmacology study investigating the effects of strong CYP3A4 inhibition with posaconazole (Part 1), two new oral formulations (Part 2), as well as high-energy/high-fat and low-energy/low-fat meals (Part 3) on the relative bioavailability of idasanutlin. After completing Part 1, 2, or 3, patients could have participated in an optional treatment with idasanutlin. Clinical endpoints were pharmacokinetics (PK), pharmacodynamics (PD) of MIC-1 elevation (Part 1 only), and safety/tolerability. The administration of posaconazole 400 mg BID × 7 days with idasanutlin 800 mg resulted in a slight decrease (7%) in Cmax and a modest increase (31%) in AUC for idasanutlin, a marked reduction in Cmax (~ 60%) and AUC0 (~ 50%) for M4 metabolite, and a minimal increase (~ 24%) in serum MIC-1 levels. Cmax and AUC were both 45% higher for the SDP formulation. While the low-fat meal caused a less than 20% increase in all PK exposure parameters with the 90% CI values just outside the upper end of the equivalence criteria (80–125%), the high-fat meal reached bioequivalence with dosing under fasting. In patients with solid tumors, multiple doses of posaconazole, a strong CYP3A4 inhibitor, minimally affected idasanutlin PK and PD without clinical significance. The SDP formulation improved rBA/exposures by ~ 50% without major food effect. The authors would like to acknowledge key contributions from Roche colleagues, investigational site staff, and patient volunteers. This study was sponsored by F. Hoffmann-La Roche, Basel, Switzerland. AY, L-CC, GN, SB, FV, and JZ are employees of and own stock in Hoffmann-La Roche. Wilson Miller has received travel support and honoraria from Roche. JN,SE, and AR declare that they have no conflict of interest.